Cable‒stayed bridges represent backbones in the infrastructure networks and their adequate seismic response must be ensured. These structures present complex interactions between the deck, the cables, the towers and their foundation. This, in combination with the reduced damping and the outstanding slenderness of cable‒stayed bridges, renders a unique dynamic response. 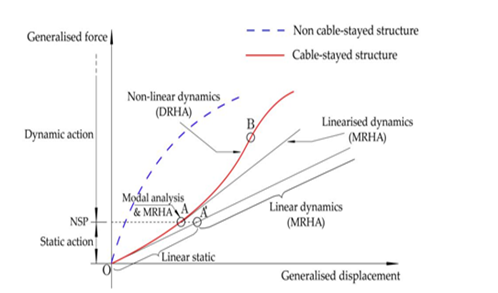 A complete review on the state of knowledge about the seismic behaviour of cable‒stayed bridges is presented here, with special attention to the analysis techniques. The current design trends in the seismic design and control of cable‒stayed bridges are also presented. They have a reduced number of supports, which decreases the seismic vulnerability of the structure and allows for important displacements of the deck. However, the intrinsic light‒weight and low‒damping levels are responsible for large amplitude oscillations when subject to dynamic excitations such as strong winds of earthquakes. As the main span of the bridge increases, cable‒stayed bridges become more susceptible to these environmental actions,4 which completely govern their design. Due to their importance and complex behaviour, cable‒stayed bridges are designed and constructed according to the highest standards. There is no evidence of catastrophic collapses in cable‒stayed bridges under seismic action. However, important damages have been reported in several cable‒stayed bridges after strong earthquakes in the 80's and 90's. This is the case of the Shipshaw Bridge (Canada, 183 m span length), damaged at the connection between the deck and the tower during the 1988 Saguenay earthquake, with moment magnitude = 6.0.5 Bruneau et al.,6 described the damage of the Higashi‒Kobe Bridge piers (Japan, 485 m span).7 Reported the severe spelling and cracking at the tower of the Chi‒Lu Bridge (Taiwan, 120 m span) after the great Chi‒Chi earthquake (1999, = 7.3), which was extended from the deck‒tower connection to the level of the lowest cable anchorages. Even these partial failures are deemed to be inadmissible today due to the large social and economic importance of cable‒stayed bridges, which emphasizes the need for research on this topic. Time‒history analysis, which can be based on the superposition of the contribution of several vibration modes in the case of Modal Response‒History Analysis (MRHA), or the direct integration of the system of dynamics (DRHA). MRSA and MRHA are based on the linearization of the response and the application of the superposition principle to combine the contribution of different vibration modes.8 Suggested that the use of MRSA is not recommended in the seismic analysis of large cable‒stayed bridges due to the errors that may be introduced in the combination of different modal maxima. However, Walker et al.,12 explored the applicability of MRSA in the Quincy Bay‒view Bridge (USA, 274 m main span) and concluded that the Complete Quadratic Combination rule (CQC)13 can accurately account for the modal coupling.14 Compared the accuracy of different elastic analysis methods in the analysis of cable‒stayed bridges with main spans between and 200 and 600 m. In this study the MRHA is identified as the most accurate analysis method for the study of the seismic response of cable‒stayed bridges in the elastic range. It was also observed that the widespread MRSA consistently underestimates by as much as 20% the peak seismic forces in the towers. Based on these results, the MRSA is not recommended in the detailed analysis of the seismic response of cable‒stayed bridges, even if it is elastic. Figure 1 Qualitative difference between the load-displacement response of classical cable-stayed bridges and structures without cable-system. In the last two decades, several researchers proposed analytical models to estimate the vibration periods of cable‒stayed bridges. Based on field forced‒excitation tests on 13 cable‒stayed bridges in Japan, Kawashima et al.,26 developed simple expressions that give the fundamental periods (transverse, vertical and torsional) exclusively in terms of the main span length. Similar formulae were proposed by Guohao et al.27 More rigorously,28 included the mechanical properties of the deck and the cable system in the study of the vibration modes. Gimsing et al.,29 also idealized the vertical and the torsional responses of the deck and the cables in LCP bridges, but the stiffness of the deck was neglected. Based on the dimensional analysis of a large number of bridges, Camara et al.,24 proposed analytical expressions to estimate the fundamental modes of cable‒stayed bridges accounting for the flexibility of the towers. The results were compared with previous works and with 17 constructed cable‒stayed bridges, observing the importance of the interaction between the tower and the deck in the vertical, transverse and torsional fundamental modes, especially for main spans beyond 500 m.
The deformation of the soil surrounding the tower foundations is only involved in high‒order modes, which are not relevant in terms of displacements but may have a significant importance on the seismic forces at the tower,30 in particular the axial load.14 According to different codes of practice31,32 it is necessary to include in the analysis as many vibration modes as necessary to activate at least 90% of the mass of the structure. Satisfying this rule usually requires to include an unreasonably large number of vibration modes in the seismic analysis of cable‒stayed bridges,33 especially if they are located in rocky terrains and they have towers with lower diamond configurations (i.e. towers that connect the lateral shafts below the deck in a single central vertical pier). This is due to the large percentage of the total mass that is concentrated close to the stiff foundation.34 In order to accurately capture the contribution of high‒order modes, it is important to simulate the surrounding soil with springs that represent the foundation flexibility. The interaction between the soil and the structure (SSI) can significantly affect the seismic input in terms of frequency, amplitude and duration. This phenomenon attracted the attention of researchers, particularly in the 90's, but there is still no clear consensus on its effect in cable‒stayed bridges. Zheng et al.,35 suggested that SSI may be especially relevant if the foundation soil is soft and contains characteristic frequencies that are close to the governing modes of the bridge. Abdel Raheem et al.36 Observed that SSI can reduce the seismic forces in the towers. Betti et al.,37 concluded that the inclination of the seismic waves with respect to the foundation can isolate the superstructure thanks to the rocking movement. However, Fan et al.,38 pointed at the negative effect of SSI, especially if the deck is not connected to the towers (usually referred to as floating connection). More recently, Soyluk et al.,39 studied the seismic behavior of the Jindo Bridge (South Korea, 344m span) and noticed the important increment of the longitudinal response quantities (parallel to the traffic direction) in the tower when SSI effects are included. Soneji et al.,40 investigated the bi‒directional seismic response of a cable‒stayed bridge and observed that SSI does not affect the longitudinal shear force at the tower base, but it can strongly increase the transverse response if the stiffness of the soil strata ranges from low to medium. This study also concluded that SSI is important in the response of cable‒stayed bridges in which the deck is isolated from the towers. The vibration of the cables transfers energy between the deck and the towers during the earthquake, a phenomenon that is usually referred to as cable‒structure interaction. This effect was first studied by Leonhardt et al.,41 and subsequent works have observed that the cable‒structure interaction is usually beneficial in the seismic response of cable‒stayed bridges. The cable‒structure interaction can reduce down to 30% the transverse force exerted by the deck against the towers in a cable‒stayed bridge with 400 m main span.34 However, the structural response can be increased significantly if the bridge is subject to narrow‒band earthquakes with dominant frequencies that are close to the first global and local cable vibration modes.42 Tuladhar et al.,43 observed the importance of the cable‒structure interaction if the first natural frequencies of the cables overlap with the first frequencies of the bridge. Caetano et al.,44 generalized this result by testing mass‒cable systems excited perpendicularly to the axis and demonstrated the influence of the cable‒structure interaction if the structure has global vibration modes with frequencies close to the fundamental modes of the cable, or twice this value. The cable vibration can also introduce a significant amount of energy through higher‒order modes, which are relevant in terms of the seismic forces.2,3 The cable‒structure interaction can be analysed by using multiple elements per cable (MEC) in the Finite Element model of the bridge. Several authors observed that the accuracy of the seismic response is improved using MEC.3,43,45,46 Caetano et al.,44 conducted sensitivity studies in the Vasco da Gama bridge (Portugal, 420 m main span) to conclude that discrediting each cable with 9 elements yields errors below 5%, even in the longest cables (226 m long). However, Ni et al.,47 suggested that only the longest cables between towers (465 m long) in the Ting Kau bridge (China) need to account for the local cable vibration. Cable‒stayed bridges have characteristically low damping levels and assuming 5% as the standard fraction of critical damping (ξ) may fall on the unsafe side.48 The total damping depends on the relative contribution of each member (towers, cable‒system and deck) and their interaction between each other. Kawashima et al.,48 observed the strong dependency on the damping of the vibration modes, and the part of the bridge that is involved in the corresponding modal shapes. This work proposed a method to estimate the global damping by dividing the bridge into several sub‒structures with the same dissipation mechanisms and applying the superposition principle. The structural dissipation directly depends on the amplitude of the oscillations.48,49 Consequently, bridges with harp cable‒system arrangements present larger longitudinal oscillations and higher associated damping values than the homologue bridges with fan or semi‒fan cable‒arrangements. To complete and complicate the picture even more, the structural damping also depends on the coupling between modes, the wave‒propagation velocity, the dimensions of the foundations and the direction of the response in consideration. The dissipation mechanisms in the seismic response of a cable‒stayed bridge comprise structural damping, bearing friction, internal slip of wires inside the cables (friction), foundation radiation, aerodynamic damping and system damping (due to the interaction between the deck, cable‒system and towers42). In the analysis, damping is usually simplified with damping ratios that are associated with the vibration modes of the structure. A Rayleigh damping distribution is typically assumed in DRHA, imposing the target fraction of critical damping in the fundamental and the higher‒order vibration mode of interest. However, based on the seismic analysis of the Yokohama Bay bridge (Japan, 460 m main span) Yamaguchi et al.,50 recommended to avoid using Rayleigh damping distributions in the study of cable‒stayed bridges with non‒linear deck‒tower connections. In addition, the structure may incorporate special‒purpose devices to add supplemental damping against ground motions, which is discussed in the following. The most accurate representation of the damping in the structure and auxiliary devices is the realistic characterization of the post‒elastic cyclic response of different members, which dissipate the seismic energy through hysteresis loops. The ground motion at the abutments, the piers and the towers can be significantly different due to the large separation between them in cable‒stayed bridges, and it is known to be important in the seismic response of these structures,2,21,51 especially in multi‒span cable‒stayed bridges.52 The main sources of the lack of synchronism of the seismic action are:53 Wave time‒shift between supports (∆) due to the finite apparent propagation velocity of the seismic waves and the incidence angle of the bridge centerline with respect to the fault (θ). Loss of coherency due to complex refractions and reflections of the seismic waves, especially in the high‒frequency range. Abdel–Ghaffar et al.2 & Priestley et al.,53 suggested that this effect can be ignored as a first approximation in the study of flexible structures (with fundamental periods larger than 1 s), which is usually the case of cable‒stayed bridges with a total length above 350 m (200 m main span). However, Zerva et al.,54 observed that this effect can be important in highway bridges (not cable‒supported) shorter than 160 m. Filtering effects and local amplifications due to changes in the properties and the urography of the soil along the bridge. The asynchronous excitation of the supports adds a set of pseudo‒static forces to the response that should be considered in bridges with `long' spans. There is some disagreement among code provisions on how to define the total length of the deck beyond which the spatial variability of the seismic action should be considered55 suggests that = 600 m. EN1998‒231 takes into account the apparent wave propagation velocity ( ) to recommend values of = 120 m or = 240 m for bridges located in soft (TD) and rock (TA) terrains, respectively, or with significant changes in the foundation subsoil along their length. Both recommendations ignore the structural response, which is known to be important. Abdel–Ghaffar et al.,2 observed that the effect of the spatial variability of the seismic action increases with the stiffness of the structure. For instance, larger pseudo‒static effects are expected in cable‒stayed bridges with prestressed concrete decks, in comparison with composite (steel‒concrete) or steel girders. Nazmy et al.,51 concluded that neglecting the spatial variability may underestimate the seismic response of cable‒stayed bridges, but the level of error depends on each particular case of study. Aspects like the foundation soil, the main span length, the stiffness of the structure and its level of hyperstatism have been found to be important. This is supported by the work of,56 where it was observed that a 400 m main span bridge (total length of 720 m) can be more sensitive to the wave‒passage effects than longer span bridges due to its larger stiffness. In conclusion, in order to address the influence of the spatial variability, the distance between piers should be compared with the wavelength of the seismic excitation in the range of the most contributing vibration frequencies of the bridge (as well as in the case of the existence of important discontinuities in the foundation soil). Figure 2, adapted from Abdel–Ghaffar 2 & Nazmy et al.51 illustrates the influence of the span arrangement in cable‒stayed bridges in relation to the wavelengths of the ground motion. The simplest analysis method to account for the spatial variability in cable‒stayed bridges, which follows, 31 is to estimate the pseudo‒static forces from static analyses in which different sets of displacements are imposed at the foundations (which in turn depend on ∆). These are combined with the inertial component of the seismic forces (obtained from MRSA) using the SRSS rule, which indirectly assumes that both terms are completely uncorrelated. Der Kiureghian et al.,57 generalized the MRSA to include the wave‒passage effect, loss of coherency and site‒response in the acceleration spectrum. Allam et al.,58 proposed a response spectrum method for the study of cable‒stayed bridges under asynchronous excitations, representing the earthquake by its Power Spectral Density (PSD) function and a spatial correlation function. Also in the frequency‒domain, Dumanogluid et al.,59 performed random vibration analysis to study the stochastic asynchronous response of the Jindo Bridge, observing the importance of the pseudo‒static and the dynamic components. The analysis in the frequency domain assumes a linear seismic response. Alternatively, the nonlinear time‒history analysis (DRHA) can be used to account for the geometric and the material nonlinearities by imposing asynchronous accelerograms at the supports of the bridge. These are generated (or modified from recorded signals) by including the wave passage effects, the loss of coherency or the lack of homogeneity in the foundation soil along the length of the bridge. Soyluk et al.,60 compared time‒ and frequency‒domain analyses in the study of the asynchronous seismic response of the Jindo Bridge. It was observed that the response of the deck and the towers is generally much larger in the time‒history analysis than in the stochastic analysis. Mitigation design, in which special‒purpose devices are installed to concentrate the seismic damage and to keep the main structure in the elastic range. Nowadays, seismic mitigation seems to be the preferred option in the design of cable‒stayed bridges located in earthquake‒prone areas because the towers can remain essentially elastic. This is strongly advisable considering the key role of the towers in the structural integrity of a cable‒stayed bridge and the complex reparation of their large sections. Furthermore, important displacements are assumed and expected in cable‒stayed bridges due to their large flexibility; therefore, the increment of the displacement demand by using anti‒seismic devices is not normally problematic. Moreover, cable‒stayed bridges present very low damping values and it is recommendable to add auxiliary sources of energy dissipation. Unfortunately, the advantages of mitigation design are frequently marred by the increased cost of the anti‒seismic devices and, especially, of their maintenance, in combination with the uncertain long‒term behaviour related to ageing effects in the dampers.61 Two of the most important cable‒stayed bridges in the world, the Rion‒Antirion Bridge (Greece, 3x560 m main spans) and the Stonecutters Bridge (China, 1018 m main span), combine capacity and mitigation design. These structures include dampers to dissipate the seismic energy and allow for some structural damage in the towers in order to reduce the uncertainty under unexpectedly large earthquakes (it is sometimes referred to as ‘partial isolation’). In the same line, Abdel–Ghaffar2 proposed that the seismic‒control system should be composed of several sub‒systems (e.g. limiters and initiators devices), including robust elements in order to ensure the structural integrity. To dissipate energy through the hysteretic response of the lead core after yielding. Abdel–Ghaffar2 & Ali9 verified the efficiency of the deck isolation with LRB, but this decreases by increasing the main span length. The poor performance of passive devices in the seismic control of long‒span cable‒stayed bridges when they are installed at the deck‒tower connections and at the abutments was echoed recently in Astiz et al.62 & Camara et al.,63 respectively. The efficiency of viscous fluid dampers (VD) and yielding metallic dampers (YMD) in the transverse seismic control of cable‒stayed bridges was presented in.62 VD resulted more efficient in general but a large reduction of the seismic demand in the towers of a 200 m span bridge with YMD was also observed. The advantage of YMD equipped in the transverse deck‒tower connection is that they provide with sufficient stiffness against service wind loads and small earthquakes, but yield under large ground motions to limit the force exerted by the deck against the towers before they can be damaged. Shen et al.,64 concluded that transverse YMD combined with longitudinal devices represent an advantageous solution in the seismic control of the Sutong Bridge (China, 1088 m main span), but important aspects like the low‒cycle fatigue were not considered. A recent study presented a method for the design of YMD in the transverse connections of the deck of short‒to‒medium span cable‒stayed bridges (below 400 m main span), minimizing the tower damage, the risk of impacts of the deck against the towers and the low‒cycle fatigue.63 The position of the devices in the bridge affects their efficiency in the seismic control. Ali et al.,65 concluded that LRB distributed along the connections of the deck with the different supports, and not only at the connections with the tower, can efficiently reduce the shear forces at the foundation level and also control the displacements. Abdel Raheem et al.,36 isolated the towers by means of viscoelastic devices and dissipating energy through the controlled hysteretic response of the transverse struts between the shafts of ‘H’‒shaped towers. Soneji et al.,66 combined VD in the longitudinal and the transverse directions with elastomeric bearings (including LRB) and sliding bearings that isolated the deck of the Quincy Bay‒view Bridge. It was observed that the damping added by the VD significantly reduces the response of the isolated bridge, avoiding possible impacts between the deck and the tower in the transverse direction and reducing the length of the required expansion joints. In recent years, the efficiency of mitigation strategies in cable‒stayed bridges under near‒fault records with pulse‒like effects has been also investigated. He et al.,67 studied the response of passive VD connecting the deck and the supports in the longitudinal direction. It was observed that passive VD are very effective in reducing the response quantities if the predominant period of the ground motion is close to the fundamental period of the bridge, but their performance is much worse otherwise. Ismail et al.,68 proposed a roll‒n‒cage isolator with energy‒dissipation and recentering capabilities at the deck‒tower connections. The proposed isolation strongly reduced the seismic forces in the towers under near‒fault earthquakes. Table 1 presents the seismic control strategies adopted in some of the major cable‒stayed bridges located in seismic‒prone areas around the world. Most of the medium‒to‒long span cable‒stayed bridges in earthquake‒prone regions rely upon auxiliary anti‒seismic devices. It can be also observed that the deck‒tower connection in these structures is close to a floating solution as an attempt to reduce the seismic demand on the towers. 9,30,51,69 No reports on major failures in the cable‒stayed bridges included in Table 1 have been published to the authors’ knowledge. However, the vane‒type dampers of the Higashi‒Kobe bridge (Japan) were broken and taken off during the near‒fault Kobe earthquake (1995, = 7.2), and buckling was observed in one of the piers, along with damage in other supports.6,70 Despite of these failures, Ganev et al.,71 concluded that the structure performed outstandingly during the Kobe earthquake in 1995 ( = 6.9). There is a growing interest on the seismic control of structures with active and semi‒active devices, which require external energy to actuate on the structure or to modify their mechanical properties, respectively. Early analytical and experimental studies in cable‒stayed bridges with active dampers were conducted by Schemmann et al.72 In this work, the important reduction of the peak seismic forces with active devices was observed, especially when the actuators were located at the center of the span. Li et al.,73 analysed the effect of Active Mass Dampers (AMD) in cable‒stayed bridges, verifying their effectiveness in the reduction of seismic forces. The Benchmark control problems proposed for the Memorial Bill Emerson Bridge (USA, 351 m main span) contributed significantly towards innovative research on active, semi‒active and hybrid (i.e. the combination of active and passive dampers) control strategies. In the first stage of this problem, the bridge was excited synchronously in the longitudinal direction.74 In the second phase of the study, the orientation angle of the structure (θ) and the three‒directional asynchronous excitation were considered.75 Based on this Benchmark problem Park et al.,76 verified the superior response of hybrid strategies with LRB (passive) and hydraulic actuators (active). He et al.,67 proposed a hybrid control system with passive VD and parallel semi‒active dampers at the deck‒support connections of this bridge. The semi‒active dampers were triggered only when the required control force exceeded a certain threshold, which improved the response under near‒field earthquakes and the robustness of the control scheme. Based on a numerical study in the Memorial Bill Emerson Bridge and the Tempozan Bridge (Japan, 350 m span) Iemura et al.,77,78 concluded that passive viscous dampers with elastic bearings, and especially semi‒active devices composed of viscous dampers with variable orifices, are very effective when controlling the seismic response of cable‒stayed bridges. This work presents a review of the state of the art on the seismic behaviour of cable‒stayed bridges. Whilst general aspects on earthquake engineering and structural dynamics are omitted, the key concepts on the dynamic response of these structures are presented, with special emphasis on the analysis techniques and the control strategies. Cable‒stayed bridges present significant interactions between the cables, the structure and the surrounding soil that render a complex seismic response. The characteristic coupling between vibration modes and the reduced damping and weight of these structures may lead to large three‒directional oscillations of the deck and the cables during the earthquake. The interaction between the cables and the structure usually reduces the seismic response of the towers under a broadband seismic excitation, but it may cause significant problems if the earthquake is dominated by certain frequency bands that coincide with the governing modes of the structure. Another characteristic feature of the seismic response of cable‒stayed bridges is the lack of synchronism of the ground motion at different supports. The magnitude of the seismic forces introduced by this effect usually increases with the length of the bridge and its stiffness. However, the latter is usually ignored by current code provisions. In the early stages of the design of a cable‒stayed bridge in a seismic‒prone region, where damage in the towers is expected under extreme earthquakes of very large return periods, advanced Pushover methods that account for the contribution of several vibration modes are recommended due to their reduced computational time. However, the nonlinear response should be verified with time‒history dynamic analyses based on the direct integration of the system of equations of dynamics. A review of the control strategies in the most important cable‒stayed bridges constructed in seismic areas around the world showed that the current design solutions rely on passive anti‒seismic devices that mitigate the effect of the earthquake and keep the towers in the elastic range. In some cases, a certain level of damage can be accepted in order to account for the uncertainties in the damper response and to improve the robustness. Currently, there is a significant research interest on the active and semi‒active seismic control of cable‒stayed bridges, and the hybrid solutions with passive devices and magnetorheological semi‒active dampers show a great potential in the future of cable‒stayed bridge design. However, very few bridges are equipped with these devices. More experimental testing followed by real applications of cable‒stayed bridges with smart dampers are needed in order to take this technology one step forward. Duan X. Experimental study on seismic performance of cable–stayed bridge tower subjected to longitudinal strong ground motion (in Chinese). Tongji University, Shanghai, China; 2012. Abdel–Ghaffar. Cable– stayed bridges under seismic action in Cable– stayed Bridges. Recent Developments and their Future, Yokohama, India; 1991. Abdel–Ghaffar, Khalifa M. Importance of cable vibration in dynamics of cable–stayed bridges. Journal of Engineering Mechanics. 1991;117(11):2571–2589. He W, Agrawal A, Mahmoud K. Control of seismically excited cable–stayed bridge using resetting semiactive stiffness dampers. Journal of Bridge Engineering. 2001;6(6):376–384. Filiatrault, Tinawi R, Massicotte B. Damage to Cable–Stayed Bridge during 1988 Saguenay Earthquake. I: Pseudostatic Analysis. Journal of Structural Engineering. 1993;11 9(5):1432–1449. Bruneau M, Wilson J, Tremblay R. Performance of steel bridges during the 1995 Hyogo–ken Nambu (Kobe, Japan) earthquake. Canadian Journal of Civil Engineering. 1996;23(3):678–713. Chang K, Mo Y, Chen C, et al. Lessons Learned from the Damaged Chi–Lu Cable–Stayed Bridge. Journal of Structural Engineering. 2004;9(4):343–352. 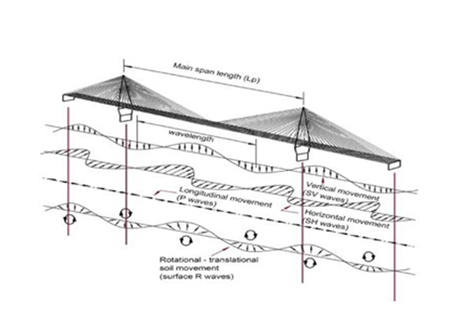 Ren W, Obata M. Elastic–plastic seismic behaviour of long–span cable–stayed bridges. Journal of Bridge Engineering. 1999;4(3). Ali H, Ghaffar A. Seismic passive control of cable–stayed bridges. Journal of Shock and Vibration. 1995;2(4):259–272. Fleming J, Egeseli E. Dynamic behaviour of a cable – stayed bridge. Earthquake engineering and structural dynamic. 1980;8(1):1–16. Wethyavivorn, Fleming J. Three dimensional seismic response of a cable–stayed bridge. In International Conference on Cable–Stayed Bridges, Bangkok, Thailand; 1987. Walker, Stafford P. The use of modal–combination rules with cable–stayedbridges. Proceedings of ICE – Bridge Engineering. 2010;163(4):225–240. Der Kiureghia. A response spectrum method for random vibration analysis of MDF systems. Earthquake engineering and structural dynamics. 1981;9(5):419–435. Camara A, Astiz M. Applicability of different strategies for the seismic analysis of cable–stayed bridges in elastic range. 2014;30(1):42–50. ATC–40. Seismic evaluation and retrofit of concrete buildings. Applied Technology Council (ATC), USA; 1996. FEMA–273. NEHRP Guidelines for the seismic rehabilitation of buildings. Washington: Federal Emergency Management Agency, USA; 1997. Lu Z, Ge H, Usami T. Applicability of pushover analysis–based seismic performance evaluation procedure for steel arch bridges. Engineering Structures. 2004;26(13):1957–1977. Paraskeva T, Kappos A, Sextos A. Extension of modal pushover analysis to seismic assessment of bridges. Earthquake engineering and structural dynamics. 2006;35(10):1269–1293. Camara A, Astiz M. Pushover analysis for the seismic response prediction of cable–stayed bridges under multi–directional excitation. Engineering Structures. 2012;41:444–455. Ren W, Peng X. Baseline finite element modeling of a large span cable–stayed bridge through field ambient vibration tests. Computers and Structures. 2005;83(8–9):536–550. Walther R, Houriet B, Isler W, et al. Cable–stayed bridges, Thelford, England; 1988. Bruno, Leonardi A. Natural periods of long–span cable–stayed bridges. Journal of Bridge Engineering. 1997;2(3):105–115. Camara A, Efthymiou E. Deck–tower interaction in the transverse seismic response of cable–stayed bridges and optimum configurations. Engineering Structures.2016;124:494–506. Camara A, Astiz MA, Ye AJ. Fundamental mode estimation for modern cable–stayed bridges considering the tower flexibility. Journal of Bridge Engineering. 2014;19(6):04014015. Manterola J. Puentes: apuntes para su diseño, cálculo y construcción. Colegio de Ingenieros de Caminos, Canales y Puertos: Coleccion Escuelas, 2006;(2). Kawashima K, Unjoh S, Tsunomono M. Estimation of damping ratio of cable – stayed bridges for seismic design. Journal of Structural Engineering. 1993;119(4):1015–1031. Guohao L. Stability and vibration of bridge structures. Beijing: China Railway Press, China; 1992. Wyatt T. The dynamic behaviour of cable–stayed bridges: fundamentals and parametric studies in Cable– stayed Bridges. Recent Developments and their Future, Yokohama, Japan; 1991. Gimsing N, Georgakis C. Cable supported bridges: Concept and design. John Wiley & Sons; 2011. Morgenthal G. Cable–stayed bridges; earthquake response and passive control. Civil Engineering Department, Imperial College of Science, Technology and Medicine, London; 1999. EN1998–2, Eurocode 8: Design of structures for earthquake resistance. Part 2: Bridges, European Committee for Standardization (CEN); 2005. Aashto. Guide Specifications for LRFD Seismic Bridge Design. 2nd edn. American Association of State Highway and Transportation Officials, Japan; 2011. Chen G, Yan D, Wang W, et al. Assessment of the Bill Emerson Memorial Bridge. University of Missouri–Rolla and Missouri Department of Transportation– Organizational Results Research Report (0R08.003); 2007. Camara A. Seismic behavior of cable–stayed bridges: design, analysis and seismic devices. ETSI Caminos Canales y Puertos, Universidad Politecnica de Madrid (UPM)– PhD Thesis, Madrid, Spain; 2011. Zheng J, Takeda T. Effects of soil–structure interaction on seismic response of PC cable–stayed bridge. Soil Dynamics and Earthquake Engineering. 1995;14(6):427–437. Abdel Raheem S, Hayashikawa T. Tower nonlinear dynamic response of cable–stayed bridges under great earthquake ground motion. Hokkaido University, Sapporo, Japan; 2003. Betti R, Abdel–Ghaffar A, Niazy A. Kinematic soil–structure interaction for long–span cable–supported bridges. Earthquake engineering and structural dynamics. 1993;22:415–430. Fan L, Hu S, Yuan W. Seismic response analysis for long–span bridges considering pile/soil–structure interaction and travelling seismic wave effects. Cable–stayed and Suspension Bridges; IABSE/FIP International Conference, Deauville, Japan; 1994. Soyluk K, Sicacik E. Soil–structure interaction analysis of cable–stayed bridges for spatially varying ground motion components. Soil Dynamics and Earthquake Engineering. 2012;35:80–90. Soneji, Jangid R. Influence of soil–structure interaction on the response of seismically isolated cable–stayed bridge. Soil Dynamics and Earthquake Engineering. 2008;28(4):245–257. Leonhardt, Zellner W. Cable–stayed bridges. International Association for Bridge and Structural Engineering – IABSE Surveys S–13/80, USA; 1980. Caetano A, Cunha, Taylor C. Investigation of dynamic cable–deck interaction in a physical model of a cable–stayed bridge. Part II: Seismic response. Earthquake engineering and structural dynamics.2000;29(4):481–498. Tuladhar R, Dilger W, Elbadry M. Influence of cable vibration on seismic response of cable – stayed bridges. Canadian journal of civil engineering. 1995;22(5):1001–1020. Caetano E. Cable vibrations in cable–stayed bridges. International Association for Bridge and Structural Engineering–SED 9, USA; 2007. Au Y, Cheng Y, Cheung et al. On the determination of natural frequencies and mode shapes of cable–stayed bridges. Applied Mathematical Modelling. 2003;25(12):1099–1115. Ko J, Ni Y, GJ H. Seismic response characteristics of multispan cable – stayed bridges with stabilizing cables. Hong Kong Polytechnic University, Hong Kong. 2001;227–232. Ni Y, Wang J, Ko J. Modal interaction in cable–stayed Ting Kau bridge. Japan; 2000. Kawashima K, Unjoh S. Seismic behaviour of cable–stayed bridge in Cable–stayed Bridges. Recent Developments and their Future, Yokohama, Japan; 1991. Siringoringo, Fujino Y. Observed dynamic performance of the Yokohama–Bay Bridge from system identification using seismic records. Journal of Structural Control and Health Monitoring. 2005;13(1):226–244. Yamaguchi, Furukawa T. Nonlinear seismic response and aseismic retrofit of a long–span cable–stayed bridge. In 9th National Convention on Civil Engineering, Petchburi, Thailand; 2004. Nazmy, Abdel–Ghaffar A. Effects of ground motion spatial variability on the response of cable–stayed bridges. Earthquake engineering and structural dynamics. 1992;21(1):1–20. Tuladhar R, Dilger W, Effect of support conditions on seismic response of cable – stayed bridges. Canadian journal of civil engineering. 1999;26(5):631–645. Priestley M, Seible F, Calvi G. Seismic design and retrofit of bridges. John Wiley & Sons, Japan; 1996. Zerva A. Effect of spatial variability and propagation of seismic ground motions on the response of multiply supported structures. Probabilistic Engineering Mechanics. 1991;6(3–4):212–221. NCSP–07. Norma de Construcción Sismorresistente: Puentes. Ministerio de Fomento. Spain; 2007. Efthymiou, Camara A. Spatial variability effects of the seismic action in Cable–Stayed Bridges and modelling techniques. IABSE Symposium, Geneva, 2015;8(8). Der Kiureghian, Neuenhofer A. Response spectrum method for multi – support seismic excitations. Earthquake engineering and structural dynamics. 1992;21:713–740. Allam S, Datta T. Analysis of cable–stayed bridges under multi–component random ground motion by response spectrum method. Engineering Structures. 2000;22(10):1367–1377. Dumanogluid, Soyluk K. A stochastic analysis of long span structures subjected to spatially varying ground motions including the site–response effect. Engineering Structures. 2003;25(10):1301–1310. Soyluk K, Dumanoglu A. Comparison of asynchronous and stochastic dynamic responses of a cable–stayed bridge. Engineering Structures. 2000;22(5):435–445. Villaverde R. Fundamental concepts of earthquake engineering. CRC Press; 2009. Camara A, Astiz M. Analysis and control of cable–stayed bridges subject to seismic action. Structural Engineering International. 2014;24(1):27–36. Camara, Cristantielli R, Astiz M, et al. Design of hysteretic dampers with optimal ductility for the transverse seismic control of cable–stayed bridges. Earthquake Engineering and Structural Dynamics. 2017;46(11):1811–1833. Shen X, Camara A, Ye A. Effects of seismic devices on transverse responses of piers in the Sutong Bridge. Earthquake Engineering and Engineering Vibration. 2015;14(4):611–623. Ali, Ghaffar A. Seismic energy dissipation for cable–stayed bridges using passive devices. Earthquake engineering and structural dynamics. 1994;23(8):877–893. Soneji, Jangid R. Passive hybrid systems for earthquake protection of cable–stayed bridges. Engineering Structures. 2007;29(1):57–70. He W, Agrawal A. Passive and hybrid control systems for seismic protection of a benchmark cable–stayed bridge. Structural Control and Health Monitoring. 2007;14(1):01–26. Ismail M, Casas J. Novel isolation for protection of cable–stayed bridges against near–fault earthquakes. Journal of Bridge Engineering. 2013:19(8):A4013002. Ye S, Hu, Fan L. Seismic conceptual design of a three–tower cable–stayed bridge. IABSE symposium, Melbourne, UK; 2002. Naganuma T, Kitazawa M, Adachi Y, et al. Seismic design and behaviour of the Higashi–Kobe bridge and restoration after the 1995 Kobe earthquake. 12th World Conference on Earthquake Engineering, Auckland, 2000. Ganev T, Yamazaki F, Ishizaki H, et al. Response analysis of the Higashi–Kobe bridge and surrounding soil in the 1995 Hyogoken–Nanbu earthquake. Earthquake engineering and structural dynamics. 1998;27(6):557–576. Schemmann, Smith H. Vibration control of cable – stayed bridges; analytical development. 11th conference on engineering mechanics, Fort Laudardale, Japan; 1996. Li X, Cai J, Qiang S. Active control of long span cable – stayed bridges under seismic loads. International symposium on traffic induced vibrations and controls. Beijing, Japan; 2001. Dyke S, Caicedo J, Turan G. et al. Phase I benchmark control problem for seismic response of cable–stayed bridges. Journal of Structural Engineering. 2003;129(7):857–872. Caicedo S, Dyke S, Moon L, et al. Phase II benchmark control problem for seismic response of cable–stayed bridges. Journal of structural Control. 2003;10(3–4):137–168. Park H, Jung, Lee I. Hybrid control strategy for seismic protection of a benchmark cable–stayed bridge. Engineering Structures. 2003;25(4):405–417. Iemura H, Pradono M. Application of pseudo–negative stiffness control to the benchmark cable–stayed bridge. Journal of Structural Control. 2003:187–203. Iemura H, Pradono M. Structural control technologies for seismic enhancement of long–span bridges. Taiwan–Japan Workshop on Seismic Disaster Simulation and Loss Estimation, Taipei; 2003. Jung H, Spencer B, Lee I. Control of seismically excited cable–stayed bridges employing magnetorheological fluid dampers. Journal of Structural Engineering. 2003;129(7):873–883. Barnawi W, Dyke S. Seismic fragility relationships of a cable–stayed bridge equipped with response modification systems. Journal of Bridge Engineering. 2014;19(8):A4013003. Hongjin, Hojjat A. Wavelet–hybrid feedback linear mean squared algorithm for robust control of cable–stayed bridges. Journal of Bridge Engineering. 2005;10(2):116–123. Ok S, Kim D, Park K, et al. Semi–active fuzzy control of cable–stayed bridges using magneto–rheological dampers. Engineering Structures. 2007;29(5):776–788. Gosh G, Singh Y, Thakkar S. Performance–based seismic design of a continuous bridge. Proceedings of the Institution of Civil Engineers. 2008;161(94):177–182. Shattarat M, Symans D, McLea, et al. Evaluation of nonlinear static analysis methods and software tools for seismic analysis of highway bridges. Engineering Structures. 2008;30(5):1335–1345. ©2018 Camara. This is an open access article distributed under the terms of the Creative Commons Attribution License , which permits unrestricted use, distribution, and build upon your work non-commercially.